This started slow, but both men worked hard to get the crowd really into it after 10 minutes. Brooks took the majority of the match and Strickland made sporadic comebacks but was always on the back foot. The match changed when Strickland reversed a fireman's carry into a double stomp and unleashed a flurry of offense. Strickland hit a double stomp to the face to the floor and then to Brooks' back while he was draped across the barrier. Brooks came back with a Canadian Destroyer on the apron to win. Brooks' heel work was excellent and he has an extremely bright future. This was the perfect opener and a really great match. Yehi got little reaction and didn't seem to be known by large sections of the crowd. He worked at an intense pace and came at Bodom from all angles, lighting up his chest with some fierce chops and leaving Bodom visibly scarred. Bodom got the better of Yehi towards the end before abruptly losing via submission, although he wasn't seen to visibly tap and claimed after the match that he hadn't tapped at all. 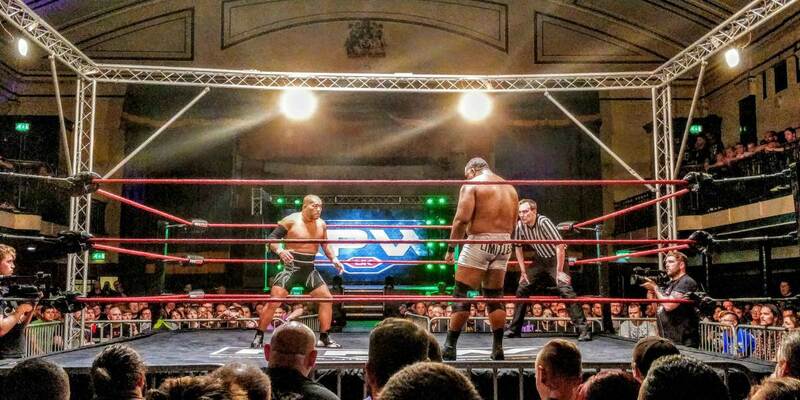 Not the perfect debut for Yehi in RevPro. Bodom attacked Yehi after the match but was held back by security, with one of them being RevPro novice Dan Magee. Bodom beat down Magee as Yehi left, but Magee got fired up and attacked back before they were separated. Starr came out and spoke at length about how there is a conspiracy in RevPro against him, and for that reason he hired an independent referee for the bout. The match was a bit sloppy, never really getting out of first gear and having the occasional botch, but the crowd was into it due to the title being on the line. Starr is so charismatic that it's impossible to boo him, so he was the crowd favorite here. Chapman was booed heavily -- he is very inexperienced and, through no fault of his own, wasn't a convincing champion. The crowd had seemingly given up on him since High Stakes back in January. Starr mocked Chapman throughout and Chapman had uninspiring comeback sequences. Starr got the win after a brutal clothesline. He got a massive pop and, despite being a heel, Starr is adored at RevPro. Both teams were massively over, getting dueling chants throughout. It started at a steady pace with both teams feeling each other out, then the tempo steadily increased to full-out craziness. The crowd was into every single move -- from Cobb suplexing both of Aussie Open to Davis going wild with chops and slaps. Riddle was outstanding here, being the epitome of enthusiasm and energy as he was itching to get into the match. When tagged in, he went wild with kicks and stiff knees. The crowd bought into two near falls: Riddle's Bro to Sleep and an agonizing piledriver from Davis. Fletcher then reversed the Tour of the Islands into a roll-up and got the win to the shock of everyone in the building. This was an outstanding match that the crowd loved. It was a huge win for Aussie Open, and the teams fist-bumped after the match. Ospreay came into this at a fast pace but slowed down early, perhaps saving himself for the Best of the Super Juniors. Phantasmo angered Ospreay by mocking his pose. Ospreay seemed to be working heel, which was an odd call. Phantasmo hit a lot of high-flying moves to little reaction, while Ospreay focused on rest holds. Ospreay kicked out of a stolen OsCutter from Phantasmo before hitting a top rope OsCutter and a Storm Breaker for the win. The match was subpar and, while the action was okay, they had poor chemistry. You would expect a high-flying and fast-paced match given their reputations, but that's not what this was. It was fine but could have been much more, and it faded into a stacked card. Suzuki was a crowd favorite and got an ovation during his entrance. CCK attacked both of their opponents as soon as the bell rang and they brawled for a bit on the outside. Back in the ring, both members of CCK attempted to out-chop Suzuki, both comedically failing as expected. Suzuki had to resist the urge to chop the referee, chasing him around the ring after Sabre was getting frustrated at the ref. With Sabre back in, CCK gained the upper hand until Suzuki tagged back in and dominated. With the referee's back turned, Sabre and Suzuki both applied a submission on the legal man. I don't think anyone bought into CCK winning here, so the near falls weren't convincing. But the in-ring action was still solid and kept the match from going too far into comedy. Suzuki won with a Gotch-style piledriver. This was everything it was hyped up to be and more. It was an expertly told story and was just as good as their previous match in RevPro, if not better. Lee was too powerful for Ishii at the start, with Ishii becoming more and more determined as the match went on and Lee becoming more arrogant. Lee's athleticism was on display, hitting a slingshot crossbody over the top rope and a hurricanrana. Ishii tried to suplex Lee to no avail, and Lee just kept on hitting him right in the face. As the match went on, Ishii started to wear down Lee and was able to suplex him and take him down with massive lariats. Lee became frantic and frustrated that Ishii was matching him, and he took it to the top rope, hitting a superplex. But not even a Spirit Bomb and jackhammer could put Ishii away. They kicked out of each other's finishers at one to the delight of the crowd, leading to "fight forever" chants. After a long sequence of headbutts, chops, and clotheslines, Ishii finally won with a brainbuster. This was incredibly action filled and the crowd lapped it up with dueling chants. It wasn't just a spot fest -- the storytelling was masterful and this was the perfect end to Lee's RevPro journey. He was the most popular man on the show and took in a farewell standing ovation following the match.